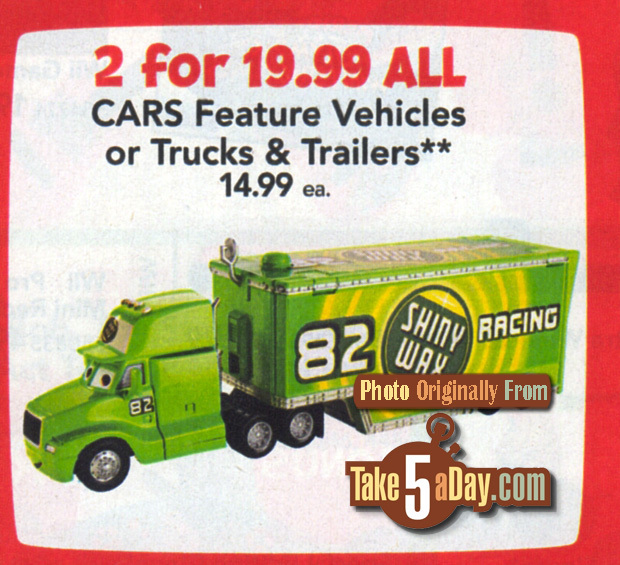 Take Five a Day » Blog Archive » Mattel Disney Pixar Diecast CARS: Shiny Wax Hauler On Shelves Friday? Mattel Disney Pixar Diecast CARS: Shiny Wax Hauler On Shelves Friday? So, send us a pic when you see it – I’m sure there’s a TRU out there with it on the shelf. (also note – if it’s GIL on the shelves Friday, please do not punch anyone). My step-son is 11 years old and knows his Disney Cars and Haulers, etc. When he came in and stated that he had been to TRU this after-noon with his real dad and saw the Shiny Wax haulers, I shot out the door to go make an attempt to retrieve one or both that he said were there. Upon arriving, none on the shelf – looked all around the Cars aisles, nothing. Questioned a floor employee about the advertisement for the Shiny Wax hauler pictured as a feature vehicle, he said that it would be in the back with the Black Friday merchandise. I don’t know which one of the above replies fits the best, but I will never believe a floor employee again. It would seem that we have been let down by TRU with it’s advertisement and their employees don’t have a clue – not funny! Sorry to all who went in search of the Shiny Wax hauler on my account, but hopefully we will see it soon! Here’s something that doesn’t have to do with this. I saw Tangled today and I loved it. They had a trailer for Cars 2 with it. No Shiny Wax Haulers in Indy… meh… par for the course I’d say! I looked at the on line TRU ad right after Nascar posted the link and did not see it, and looked through my TRU printed ad in the newspaper and it was not there either. (MET: Thanks, 8 PM post written already 🙂 ). The Bewitched – Samatha Barbie is now in the Toys R Us for Black Friday….. CONFIRMED as Dennis’s wife works for toysrus and saw them. Shiny wax haulers here in the UK, along with Jerrys, no stalls, and dinoco!!!!!! Doug are they Multi – languages or only English??? Only haulers for past decade (it feels that long at least) on the shelves of my local Disney store & TRU are Mac, Gil, PV & Sidewall Shine! Where did you see this pot of gold? Maybe he got Sidewall and Shiny Wax confused because of the name? More like Gil as they have appearred on the shelves again in the UK over the last week. with PV again. “Come back Friday….when I won’t be here” is more like it. 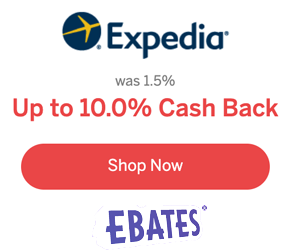 Has anyone got the ToysRus ad in their email? Lucky you. In here there is no special on CARS except a 50% OFF on Mater de Greater Playset. Was crazycarsdd’s nephew that saw it, and said it was shiny wax. We’ve waited a long time for the Shiny Wax hauler… hopefully we don’t have to wait too much longer. I still want to know what a feature car is. the ad says feature vehicle or truck & trailers. Our walmart is all set up for the midnight sale tomorrow, sadly the disney cars for black friday still showed enroute as of today. Manager said he is doubtful they will arrive in time. However he said he will keep them at $10 if and when they show up. I’m bummed. I’m still going to hunt for the 4 pack on Friday but not holding my breathe. However they did pull all cars out of the back before I was there today and the 3 pack lenticulars were well stocked with some I’d never seen. 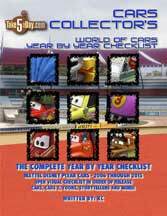 The lenticular pegs were full some with 5-7 of a style, 2 chase mater with oil can, all new deluxe wrestling toons, 16 mood spring haulers and 1 lonely gil and of course the old old old single toons. Nice to see the shelfs full, now I just want them full of things I need. 8 Trunk Fresh haulers at our TRU. No back stock. I’m not holding my breath for Shiny Wax showing up by Thursday night/Friday morning. (MET: Trunk Fresh is greenish …). Gil is green as well. I’d much rather have Chet the Gray Boxkaar, though. He’s a garbage truck, and Shiny Wax hauler may be in it. (Joke). Reason I said that is a few years ago when Wal-Mart had the exclusive Oversized Cars in their BF ad, an employee told me they’d have all 6. Well – turned out they ended up getting all just Case A (Mack, Barney, and Al Oft) but no Case B. (MET: I believe there are 4 paths. It means nothing because you should never believe what a guy wearing a giraffe costume tells you. It’s totally correct – just not that today). There is no doubt in my mind that the employee saw the ad and just said come back for the special price on Friday. In other words, he don’t know Shiny Wax from Shinola.